If there's one perk I'd choose for maintaining my membership in a frequent flier miles programme, it's got to be access to the business class lounge. I know it's not feasible in domestic flights across the U.S. - American Airlines even charges $50 for a day use of their Admirals Club (shame on them!) - but for flights going out internationally, being able to use the amenities of a more private enclosure in an airport makes flying to the far corners of the earth more, shall I say, relaxing. After an initial panic earlier in my apartment - stupid me, I locked myself out when I brought my 2 luggage out and left my carry-on with the keys inside behind the door - I thanked the drizzly heavens above for 1. my building superintendent 2. no traffic on my way to JFK 3. Terraces Lounge. No. 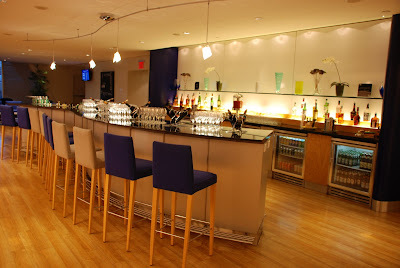 3 is British Airways' business class lounge at the JFK which is also used by Cathay Pacific passengers. I've been here many times, thanks to my loyalty to one of Asia's premier airlines. On the two occasions that I flew on British Airways to London, I had the chance of trying out the on-site Elemis Travel Spa at the lounge. I'm talking here about complimentary spa service - what I got before boarding the plane was a soothing 30-minute massage! 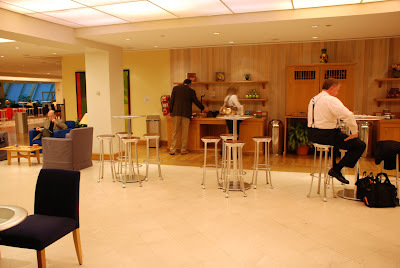 For selected night flights, Terraces Lounge also offers pre-flight supper prepared a la carte which means a longer sleep for those who want to rest once inside the plane right away. 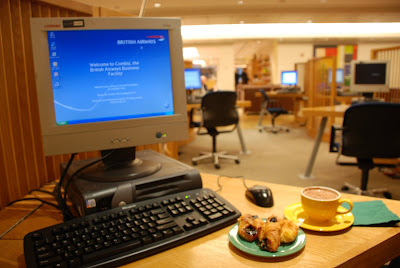 As I usually do when I'm here, I took the opportunity of using the free internet access. Thankfully, the lounge has plenty of PCs available. And what else would I be doing while waiting for my flight but update this blog? Complimentary food and drinks are available as well and at this early hour of the day, there's a good selection of breakfast treats: cereals, fruits and pastries, brewed coffee and fruit juice. Newspapers and magazines abound but everyone else seem busy eating or checking e-mail via PCs, laptops or that ubiquitous Blackberry. Perhaps, what makes JFK Terraces Lounge stand out is that the lay-out and subtle lighting provides an atmosphere of tranquility and civility. Sofas and lounge chairs are spread out in a way that I don't feel so close to another soul. It's so easy to gather one's thoughts in the midst of all that general madness typical in an airport. Ah, the journey hasn't even begun but I'm already enjoying it!